All week I'd been excited about Friday night. I wasn't going out, I was going canning! 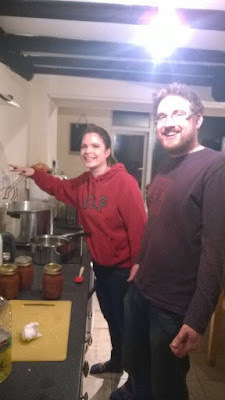 A friend, Sarah, and me were going round to Kirsty's house to try out her new pressure canner that she'd had for Christmas. We were going to be adventurous and try canning meat for the first time. 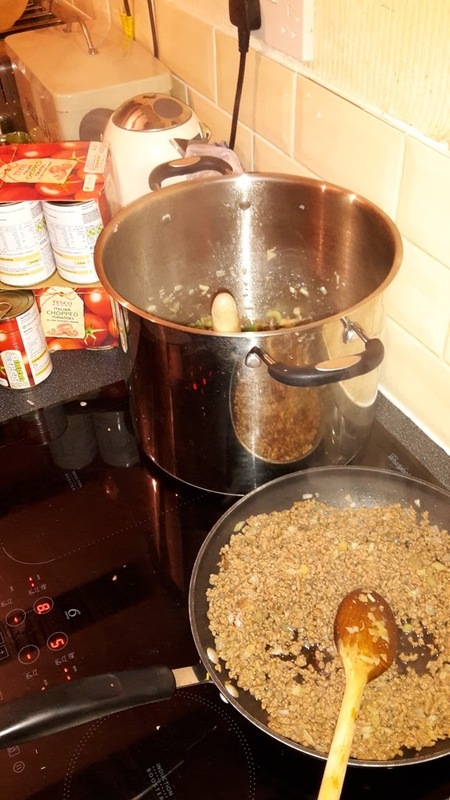 We'd decided on a spaghetti sauce with mince beef in it, Kirsty had found a recipe we like the look of a few weeks before hand, so we all brought some ingredients with us and we set to it. Things went well, the only slight hitch we had was the fact that the electric hob wouldn't get the canner hot enough, so Kirsty had a brain wave and got her gas BBQ dragged inside. Propped up with a chair this was perfect to keep the cans at 11 pounds of pressure for the 60 minutes needed. We did leave a window open so we didn't die from poisonous gas as well! 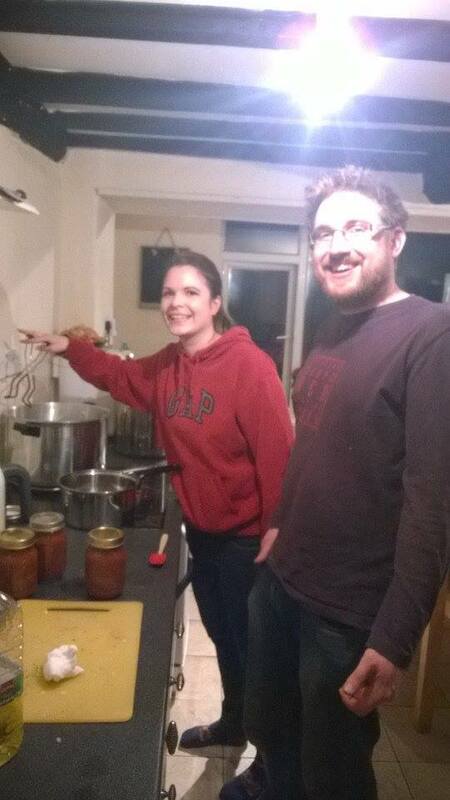 In the end we had ten jars, with only one that failed to seal properly. I can see this being a very addictive hobby! 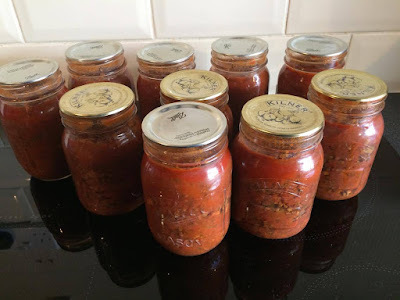 Anyone else been canning meat or does using a pressure canner put you off? 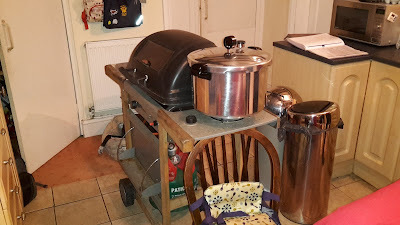 what a fab way to spend a friday evening, great news that you have moved onto canning meat, I have done chicken and turkey meat and chili, I want to have a go at doing some bacon when we next do a pig. The things I do for fun! I'm thinking rabbit and lamb stew in cans would eb pretty good as well! Been canning meat for many years. I usually can the meat plain and then use it in whatever dish I'm cooking - beef cubes into beef stew, ham pieces in scalloped potatoes with ham, etc. I mostly like canned meat better than frozen - no freezer burn. I like the idea of having these first few as home made ready meals. Sometimes with young kids running round it's great to have a meal easily to hand. I do lie the raw meat packing methods though and I'm keen to try them. I havent done canning meat yet. The price of a pressure canner has been putting me off. One day it will make it to the top of our priority list! This isn't my pressure canner because the same thing has been putting me off as well! Good grief, not being able to get it hot enough would set off a minor panic! Brilliant save on Kristy's part and great job, all of you! It was some quick thinking on her part! Have never been able to afford a proper "Canner" but have bottles by the bain marie method in the oven (many years ago). I have never tried meat though, only veg and fruit. We did fruit last year and I plant to do much more of it this year as well! I'd like to pressure can veg as well, beans etc. The cans are pretty expensive as well. I've been buying a few every now and again but I want to get some reusable lids from the states to make things a bit cheaper. 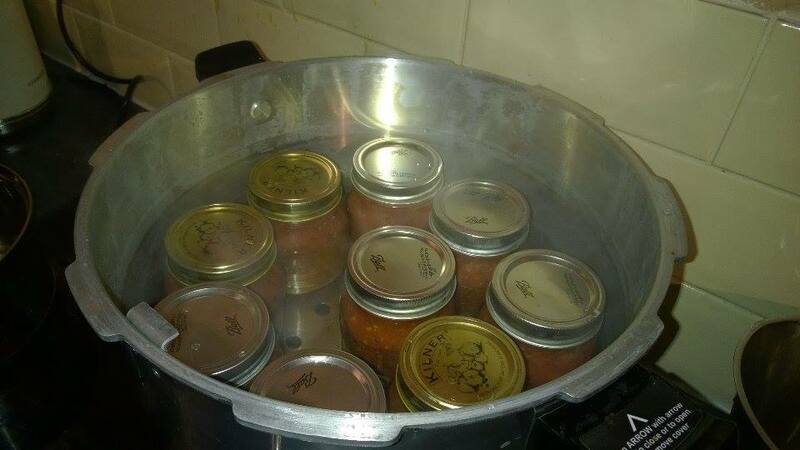 Not pressure canning just hot water bath method - well done! Did you import the canner from the US? It's not mine , my friend managed to buy one second hand. Look at you! A job well done, sometimes a little grease or a seed will get in the seal area and prevent a seal when canning. You can get rid of those rabbits that keep getting through your fence, put them up in jars. We have 3 pressure canners as they can be picked up cheaply here, my newest doesn't use a gasket so it will be a little less trouble as the gasket will leak a little eventually. I try to stretch the gasket after it hasn't been used for awhile. The one jar wasn't quite down enough as we squeezed in ten and should have only done nine. I'd like to get my own canner eventually so I can do veg in the summer to save having the freezer full all the time. The canners are very expensive over here so I need to keep my eyes pealed. Would love to know where you got the canner from in the UK ? My friend got it second hand. I'm still looking for the best way to get one. I only do Paté (with meat), and the sterilising takes 3 hours even though the system looks much the same. I use Le Parfait jars and capsules. I do love Paté, maybe it's somethign I should look at making. In the smaller jars as you never want too much. I remember working in France a few years ago and the chef was drunk when he made our dinner. We pretty much had a lb of Pate each as a starter! I have never pressure canned, I just preserve by bottling as I have never wanted to do meat, it works for me. Pressure canners are expensive, however if given minimal care and a new gasket every few years they are so useful. Ibought my Presto new in 1971 and used it last week to can a turkey I found on sale for .75 per lb. Seven quarts of ready to eat meat. The outlay for good tools can be daunting but the savings and convenience over the years makes it well worth it.